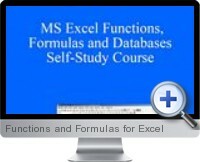 Functions and Formulas for Excel is a downloadable self-study course containing 16 Excel workbooks of useful tools for learning and practice. Functions and Formulas for Excel focuses on powerful functions and formulas of Excel such as SUM, SUMIF, COUNT, COUNTIF, SUMPRODUCT, IF, INDEX/MATCH, MAX, MIN, INT, YEAR, MONTH and many more. In addition, the Functions and Formulas for Excel course provides learning for making drop down lists, protecting Excel sheets, formatting, and how to build and link databases and other tools to Excel applications.